If you fancy a go at building a boat or maybe starting with something smaller like a rudder then check out the building guides. Please make sure you are kept informed through our e-mail list and Association membership. If you have any thoughts, queries or ideas then either post them on the discussion forum to ask other people in the class what they think or contact the Association reps. Did you know that the Association publishes a set of handicaps covering the various ages / sections of the class. These handicaps are based on the relative speed at the time the designs would have been new. Carbon Boys . . lighten up! Is it time to consider more sail area? 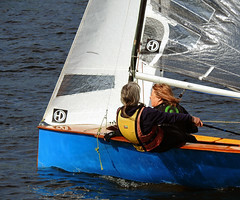 Junior Sailing - The only way forward! 1994 Controls what to do! 08-Apr, Building a Highjack ?? Membership allows us to run the class for you. We can't do it without you.